Here we see the fundamental phases of Enterprise Transformation, laid out over the domains of the Enterprise. The Direction part of the Enterprise feeds requirements for transformation into the Transformation part of the Enterprise which delivers change into the Operations part of the Enterprise. It should be noted that the Transformation part of the Enterprise may also deliver change into the Direction, Support or even Transformation (the whole point of POET) part of the Enterprise but we just show Operations here as that is the most common occurrence. These phases of Transformation are not strict and rigid waterfall type “processes”, but every journey has to be split up into parts, and these high level phases form the high level parts of the journey, by which to consider holistically, how Transformation is effected from the formulation of Strategy to the Deployment of change into the Enterprise. For each phase, the How that is effected is done by the next phase down, and the Why comes from the phase above. The key to the Transformation cascade working together holistically and coherently is the Governance and Lobbying disciplines which use the concept of Transformation Debt™. The white horizontal line at the top of the Transformation domain delineates the transition planning work from the project execution work. Everything below that white line is effectively “projectland” The white horizontal line at the bottom of the transformation domain delineates project execution work from the deployment work. Our remit is not only what is happening in one of these areas. Our remit is what is happening in all of these areas. In general people work within these areas and in most Enterprises these people try to improve what they do (if they are allowed) and how they do it. This is a laudable thing to do, however, no one is looking at the whole cascade and ensuring that the whole cascade is effective and efficient. The parts are being optimised at the expense of the whole. POET provides the basis for Senior Management to address optimising the whole of Transformation, for it is the output of the whole that most important rather than the output of each phase - this in fact, may mean the de-optimisation of some or all of the parts. For this reason, everything in POET applies equally to all phases of the Transformation cascade and is the unifying holistic and coherent context in which all Transformation work is performed. In terms of naming these levels there are two fundamentals. 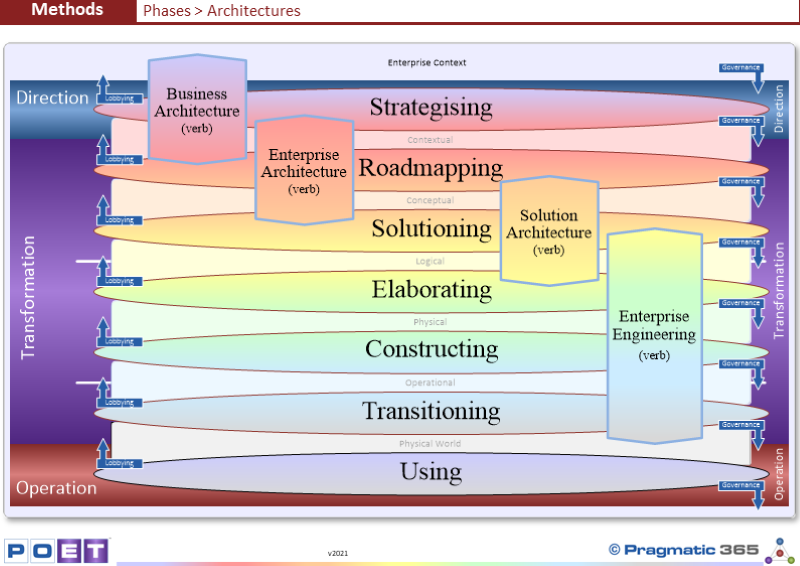 ¨ Enterprise Architecting (EA) consists of all work done prior to project execution, namely Strategising and Roadmapping. ¨ Enterprise Engineering (EE) consists of all project level work, namely Initiating, Elaborating, Constructing and Transitioning. Do you agree with these Phase boundaries? How does your Enterprise map onto them? Does everyone working within the Transformation domain understand how where they work fits into the whole? If not, would there be a benefit if they did? What will you do to allow people to understand how they fit into the whole and what will you use?